Parcel Processing | Mail-O-Matic Services Ltd.
Mail-O-Matic has the skilled professionals to prepare your packages for timely and cost-effective domestic and international delivery. Trust us to assemble, prepare, and package your mail out materials and determine the most efficient and affordable delivery method. Delivery Service selection for expedient delivery. 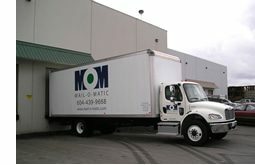 Mail-O-Matic is a full service direct marketing company and mail house fully equipped to provide parcel processing services for packages of any size or weight.